Develop concrete policy solutions to support countries in reconciling their innovation and inclusive development agendas, including options for scaling up inclusive innovations e.g. in education. The analysis will focus on China, Colombia, India, Indonesia and South Africa and draw on other countries’ experiences. The project is conducted in close co-operation with its Advisory Group composed of representatives from the project’s partner countries, delegates from the OECD’s Committee for Scientific and Technology Policy and experts. Other OECD committees and relevant networks are also contributing to the different strands of work of this project. Innovation Policies for Inclusive Development: This work will analyze the impacts of innovation and key innovation policies on industrial inclusiveness as well as their effects on social inclusiveness. 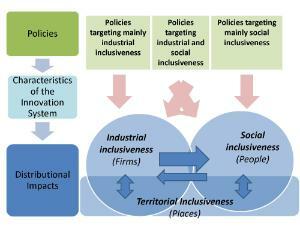 Policy Impacts on Territorial Inclusiveness: This work will discuss the geographical dimension of inclusive development and identify strategies to overcome industrial and social inequalities across places. Inclusive Innovation in Education: This work will explore inclusive innovations for delivering better-quality education to marginalized populations.